The rusk dough gets baked as one big slab. If you want traditional chunky-sized rusks, it’s best to bake it in one of those oven trays that’s about 2 inches (5 cm) deep. Leave it to cool for about 3 minutes, and then follow my tried and tested method called “Sharon’s method” below, or try one of the other methods others have recommended. If you want “Woolworths” rusks (basically less of a mission to eat than the chunky size and less of a mission in general) then follow “Sharon’s method” Ia or Ib (Ib is my favourite as it’s a longer, thinner cut). After cutting up the rusks drying them out follows the same method, no matter the recipe used. This cut gives you a smaller rusk than the Finger Cut below. Check out the gallery for pictures. 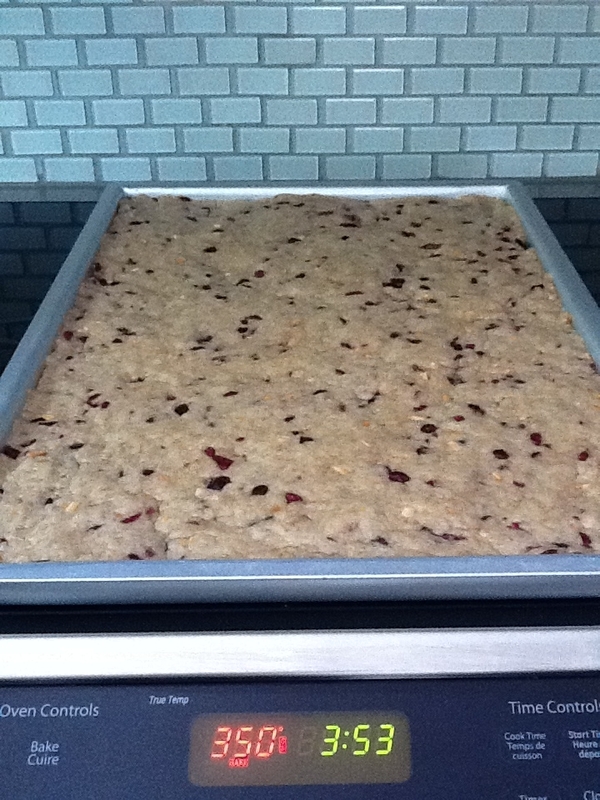 Pat the dough mixture evenly into a large, shallow baking sheet. For recipes that use 1kg or more of flour a large baking sheet will suffice. You’ll need to reduce the cooking time. If baking at 350 degrees, which is a common rusk temperature, bake for about 20 minutes – till a skewer comes out dry. Allow to cool for 5 minutes and then slice 2cm strips across the width of the pan with a finely serrated knife, and then slice lengthwise dividing the pan width into 4 even strips. The Finger Cut will give you more of a biscotti shape and size, and a rusk that’s about twice as long, but narrower, than the “Woolworths Cut”. Check out the gallery for pictures. Pat the dough mixture evenly into a large, shallow baking sheet. For recipes that use 1kg or more of flour a large baking sheet will suffice. You’ll need to reduce the cooking time. If baking at 350 degrees, which is a common rusk temperature, bake for about 20 minutes – till a skewer comes out dry. Allow to cool for 5 minutes and then slice 1.5cm strips across the length of the pan with a finely serrated knife, and then slice width-wise dividing the pan width into 3 even strips. This method definitely takes less energy! I’ve not tried this nor heard of it until I recently came across it in the Krispie Bran Rusk recipe. 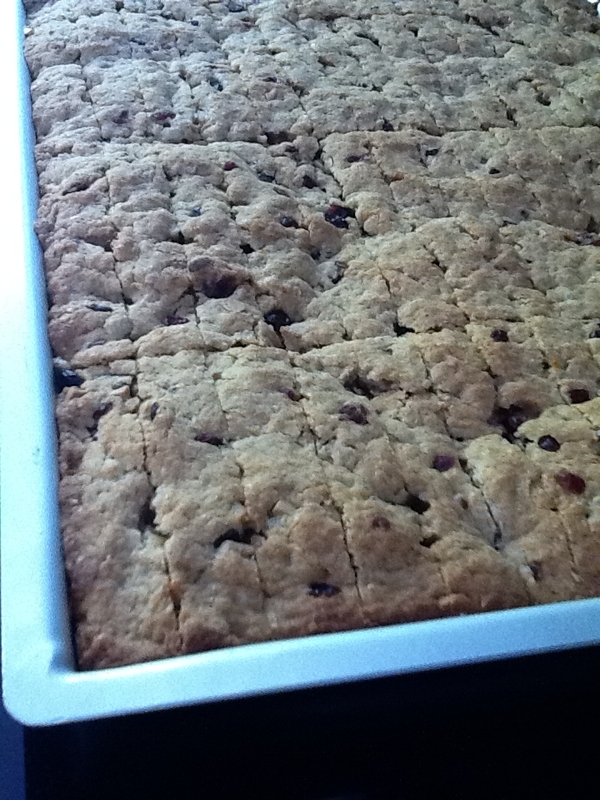 Place dough in a greased roasting pan (2 inches/5 cm deep) and then cut into rusks with a wet knife before baking. Once baked you separate the rusks at the knife marks. This is a very common method and probably saves you the hassle of cutting. 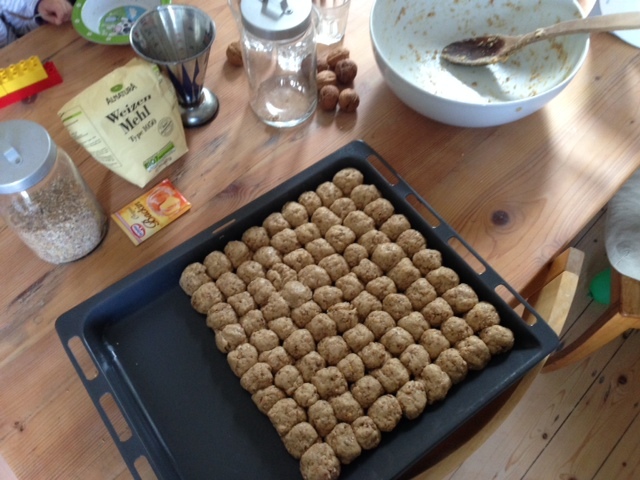 Shape the dough into sausage or ball shapes and pack them tightly in a greased roasting pan (2 inches/5 cm deep) to bake. Once baked, cool slightly and then separate the “sausages” into individual rusks by hand or cut them. Laurie, I’d love to hear what Stephen thinks of them because the cranberry rusks are not traditional in South African terms. I adapted the recipe to include some Canadian sensibilities. Remember to dry them out really well. It’s hard to over-dry a rusk! After baking your rusks (I bake in a solid sheet). cool and then place in the deep freeze overnight or for a GOOD few hours if you are in a hurry and can’t wait overnight. 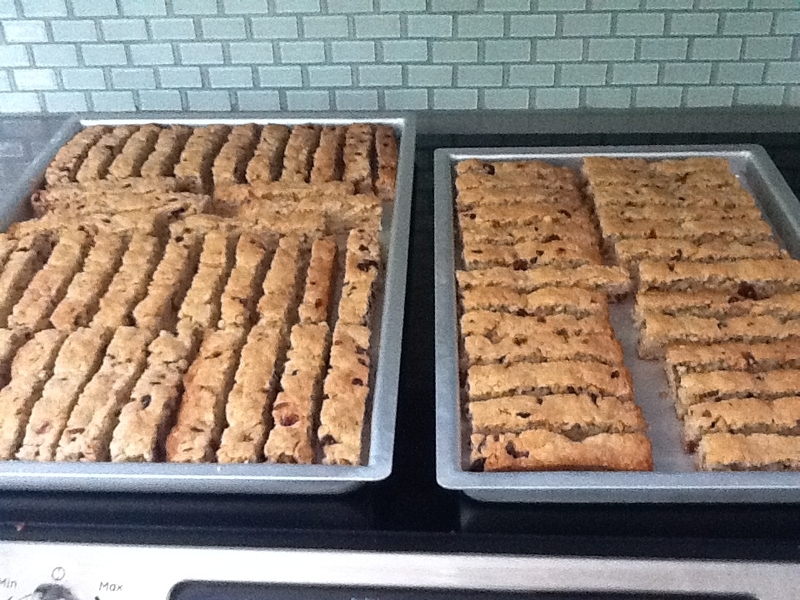 Take out and leave to stand while you put the oven on (100deg C) and prepare your baking sheets for drying. Use a large sharp knife and cut the rusks into fingers. Place on the drying sheets and pop them into the oven to dry. You will have a clean cut rusk with minimal crumbling. So, Debbie, it sounds like you’re cutting Rusks that have been frozen in the baking sheet after they’ve fully baked? Never heard of that technique before but I have wondered how some Rusks can be cut so thin and smoothly. Now I know! Thanks for sharing the tip. Hi Sharon, I have just bought myself 2 pans and a cutter (comes in a set) especially for rusks and it works magnificently. You press your dough into the pans and then while still raw cut with the cutter (the cutter is the same size as the pan – I get 45 rusks per pan). Takes all the hassle out of cutting. Lynne that sounds amazing. Can you send us a photo of the rusk cutter and tell us where you bought it so other readers can try it, too? Hi Sharon, I am in South Africa (we went to school together) and I don’t know whether you will get them in your country. If you are coming to SA for a visit I can give you directions (I bought them in Robertson). There are also different sizes. If you still want a photo I will be more than willing to send you one. The whole set is galvanised as well, distributes the heat perfectly and does not rust. I am really happy with them and sorry that I never knew about them years ago. I thought it was you! It’s great to know that things like rusk cutters exist, so if you are able to take a photo that would be great! It sounds like a really nice addition to one’s sets of kitchen gadgets. I’m intrigued by the idea of cutting the rusks before you bake them. I assume one would have to run the cutter through the dough again once baked? Have you tried? I was in Cape Town last week and saw this rusk cutter I think it is amazing and would really like to buy two. I saw the cutter at my cousin’s and she said she got it from a farm stall in Robertson. Do you know whether I can get one in Johannesburg?. Hi Elizabeth, I have no idea but perhaps they would send it to you by post. I can give you their telephone number if you like. I also bought mine at the farm stall in Robertson. It’s a wonderful addition to my set of kitchen gadgets, I am so happy that I bought the set. You know I never thought to run the cutter through the dough again once baked but that is a great idea and I will definitely try it on my next batch. I have taken some pics now so how do I send them to you as your email address is a do not reply address. Do I upload them to your site and if so how. Sorry I have looked and can’t seem to see an upload option anywhere. hi there, i make rusk pans with cutters, you cut your dough before you bake them! Hi Jan. someone told me she had bought a pan that came with a rusk cutting mechanism per baking! Is it possible to see a picture? She sent me a phot of hers which I was about to put up when you posted on the blog so I thought I’d wait and see what you have. Have tried to contact you on your cell but no reply. Please can you give me a call at your earliest convenience. I am very interested in this rusk cutter. I stay in Benoni so not sure if I can get one in Johannesburg. I made my favourite buttermilk recipe and used my electric carving knife when the the rusks were mostly cool. It worked like a dream! Not sure how it would cut through soft fruit or nuts, though. That’s a really interesting approach. Never thought of that. You’re right about the possibility of nuts, but I can’t see what that would be any less of a challenge that nuts present when cutting with a knife? Thanks for sharing your suggestion. Please can you give me the size of the tin used in the above picture. Thank you! I would very much like to purchase a new tin for rusks. i need to make abouit 48 rusks per batch. I make these rusk pans with rusk cutters, you can mail me at j-irrigation@webmail.co.za. Gee, thanks for letting me know. What version of Internet Explorer are you using? It’s working fine on a few different devices when I check but perhaps I’m using a different version of IE. Thanks a mill! Hi there! My friend picked up a rusk pan and cutter some time ago and I’m going to use it for the first time so I was happy to pick up some tips from people who use them. I live in Lesotho, but found a website in SA selling them – thebakingtin.co.za if anyone wants to order one – they range from around R450.00. Happy rusk baking! Seona Schutzler. Where can I find a rusk cutter in Brisbane, Australia? The best investment (about R300) I ever made was buying the rusk pans with a cutter included with 2 pans all the same size! You get differnet sizes for your oven as well as smaller ones for fudge! Just the best invention ever! Hi would like to know where I can find the cutter which is the same size as the pan? Hi how do i get hold of the man in the Free State who makes the ruck trays and cutters? Hi Linda. I found this link to where you can buy rusk cutters. I just did a quick Google search. You may find more. I entered “rusk cutters” into the search. Good luck! Hi there. As far as I know all the recipes on this site work. I use the Nuts n Seeds one all the time. It adapts easily too. Could you please tell me where I can get the tray and cutter. Hi David. I did a quick Google search and found many places that supply them. So you can probably find a place near you or where to order from by just putting “rusk cutter” into Google. Good luck! I have found a few but they are not in the UK or don’t send to the UK. Something to buy on your next visit to SA! Once you have cut the rusks, what is the easiest way of getting them onto the tray to dry them out. This is when I find that they break and crumb. Should you only dry them out, the following day. Maureen, I carefully lift as many as will fit onto an egglifter at a time – 3, in my case. Usually getting the first 3 out is the most precarious but doing it carefully, I’ve never had breakage. I lift them all out with the egglifter after that. Hi, my name is Anna van der Mescht.just want to say that ive tried every which way with the cutter and the ONLY way that works for me without ending up with a very messy cutter (and a few finger cuts) trying to clean the damn thing,afterwards is as follows dip the whole cutter into hot water and immediately press it into the raw dough, nice and deep/snug,ten pull it out carefully,an extra pair of hands can hold the baking sheet down, and into the oven.The cutter comes out clean and it is then very easy to cut in the lines after it is baked and cold enough after a few hours. Thanks, Anna. I’m sure others will find this helpful. I’ve never tried the cutter. I use a tomato knife because the blade is thin and it is serrated. It takes time to cut a whole tray of rusks but I’ve never had any damage. The only thing is to start cutting about a minute or two after they come out of the oven otherwise the crust hardens and cracks as you cut.